← Lorraine Pollock is Home! Lorraine Pollock is back to Normal!! 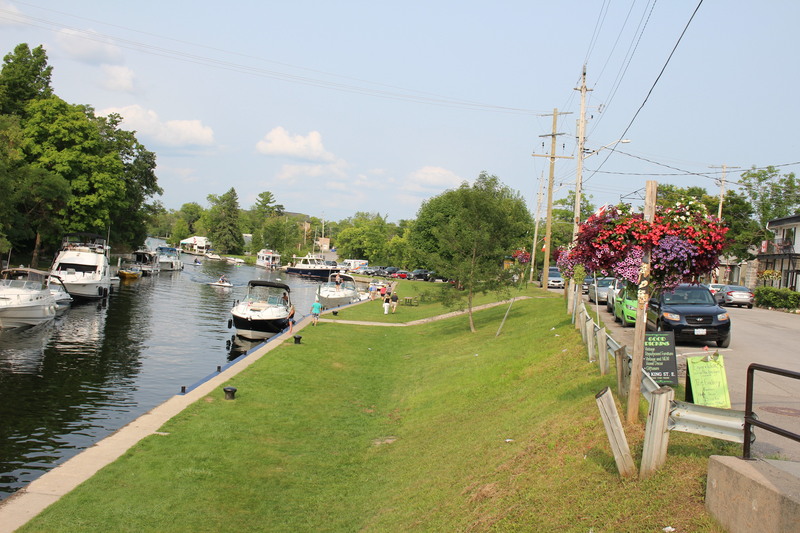 Boating on the Trent-Severn Waterway, specifically Lock 32 of the Canal in Beautiful Bobcaygeon, Ontario!! 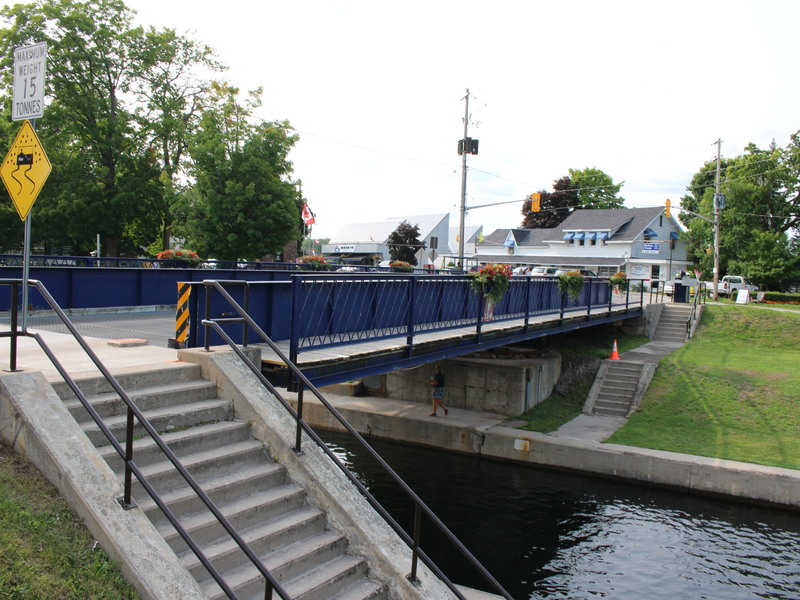 The scene above shows many boats stopped at the Bridge on the Canal System, in downtown Bobcaygeon, ON. Some of them, in fact most of them, have overnighted or will be overnighting!! How does the Lockmaster, the person controlling the Lock, and the Bridge, know which boats if any, want to pass through the Locks, and which boats cannot make it under the bridge?? There is not a whole lot of science involved in either. Look at both pix above; you will observe a wide blue line painted on the concrete, on your right. If a boat goes here, along the blue line, they wish to proceed through the lock, and move into the higher waters of Sturgeon Lake. The lockmaster acts accordingly. 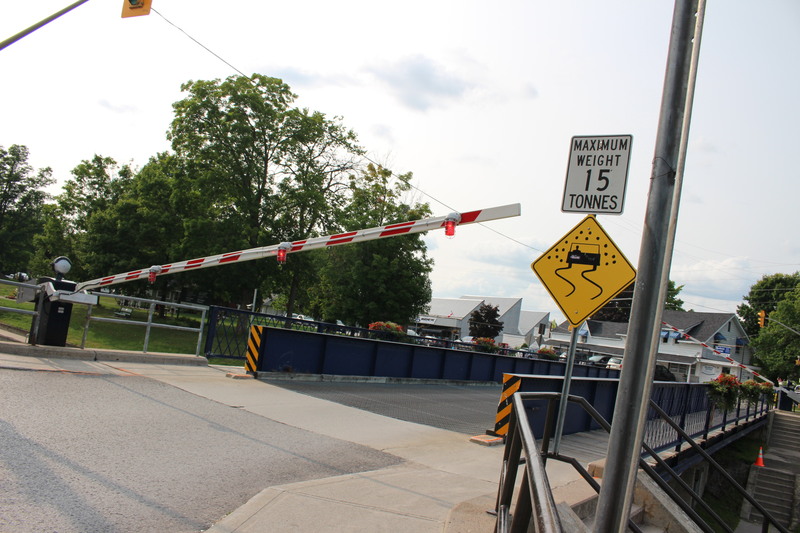 In this instance, the bridge must be opened. I captured a couple of pix as follows. First; down comes the barriers at both ends of the bridge! Here is the bridge closed. 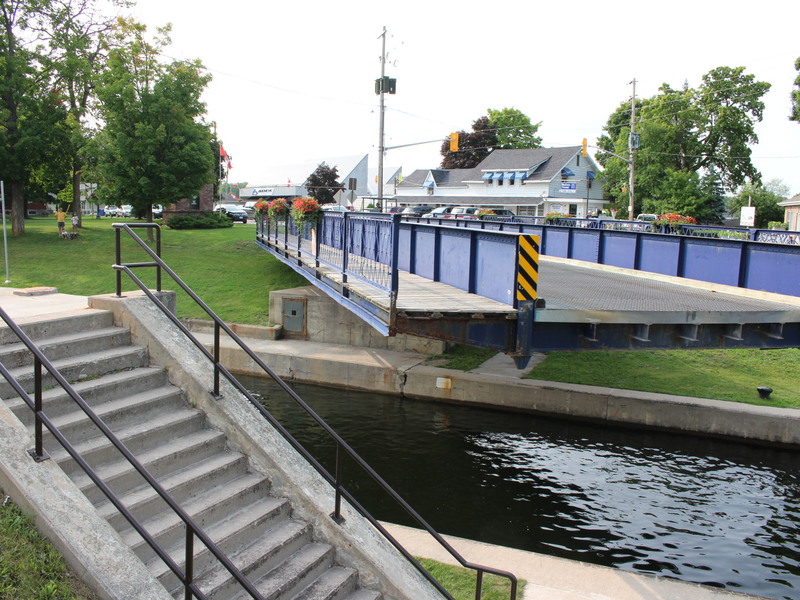 Pic below is of bridge opening!! And, here come the boats!!!! 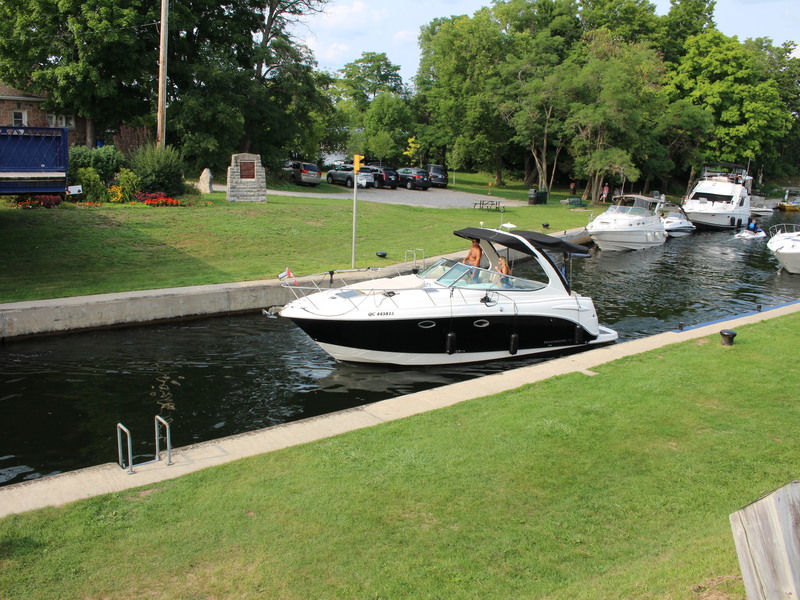 The boaters with lock knowledge will know we have done nothing to change the elevation of the boats, which is after all, the purpose of a lock. We are about to do so!! 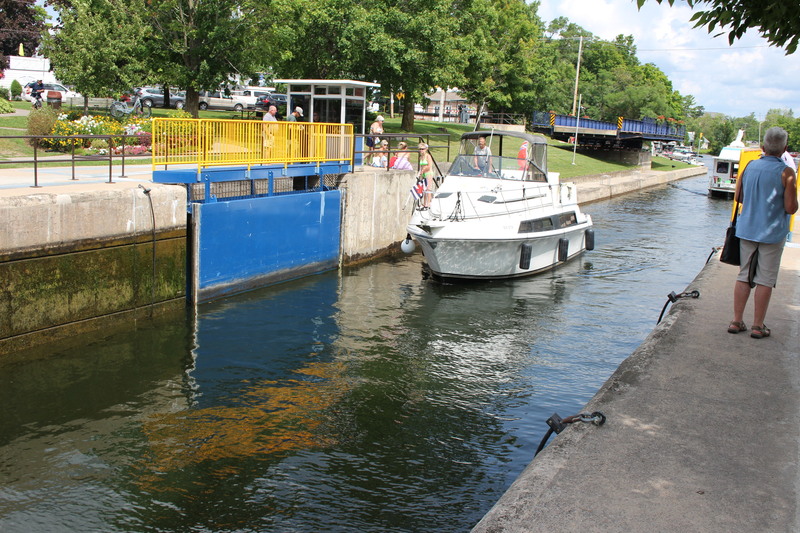 The lead boat enters the lock. 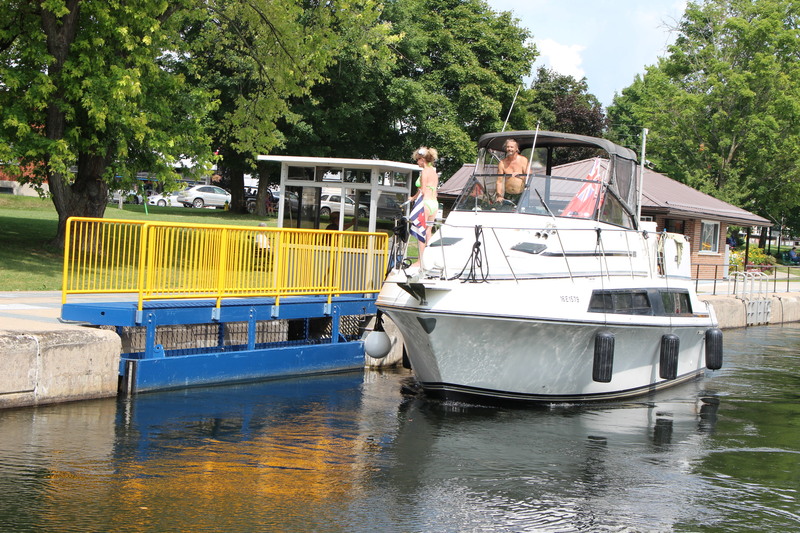 Note the blue gates; this gate will close when all boats going up stream have entered. See the pic above this one. You see a 2nd gate, up stream, which is closed, thus holding the higher level water back. When all boats are in, AND SECURED, the gate we see above will close; water will begin to flow in, and when the water between the gates, i.e. 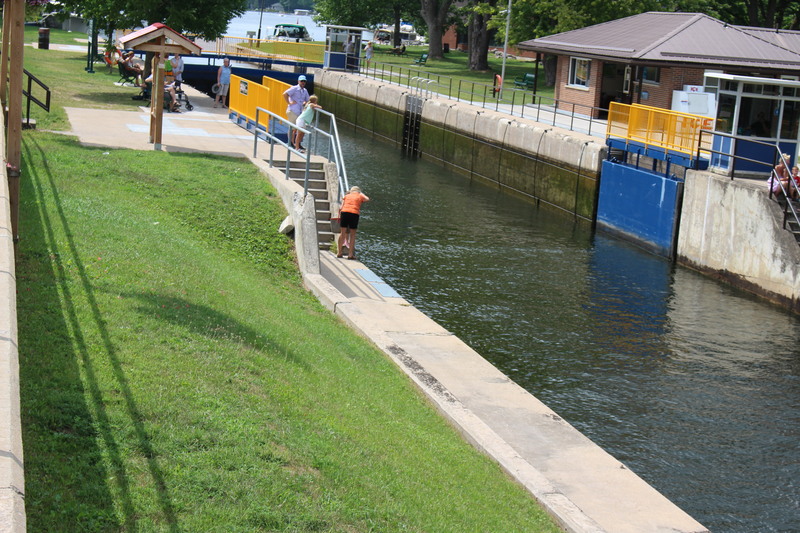 the LOCK, is at the same level as the higher level lake, (Sturgeon Lake in this case) the upper level gate will open, allowing the boats to sail out. How did I do??? Did everyone follow the explanation. Please remember this lock, Lock 32, is not a Lift Lock. 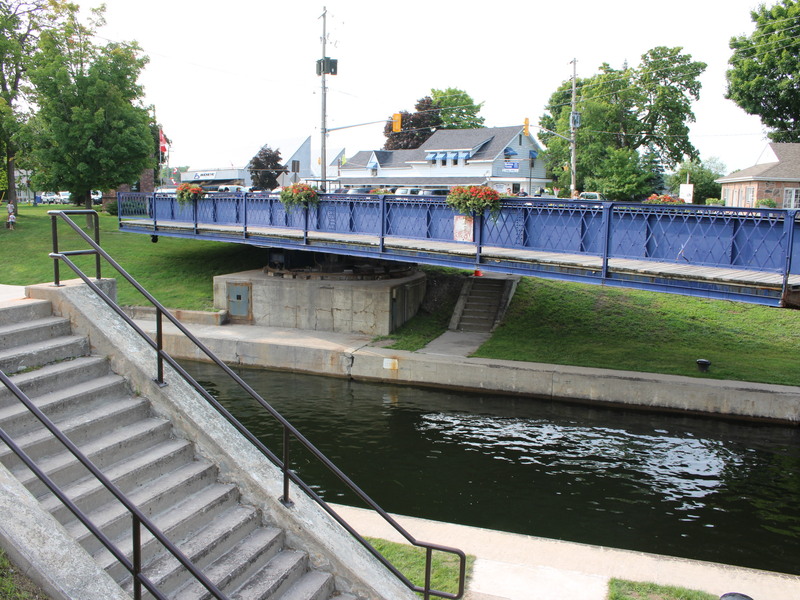 The Trent Severn Waterway does have 2 Lift Locks, and I will visit them in the not too far distant future. Beautiful pictures Stan. 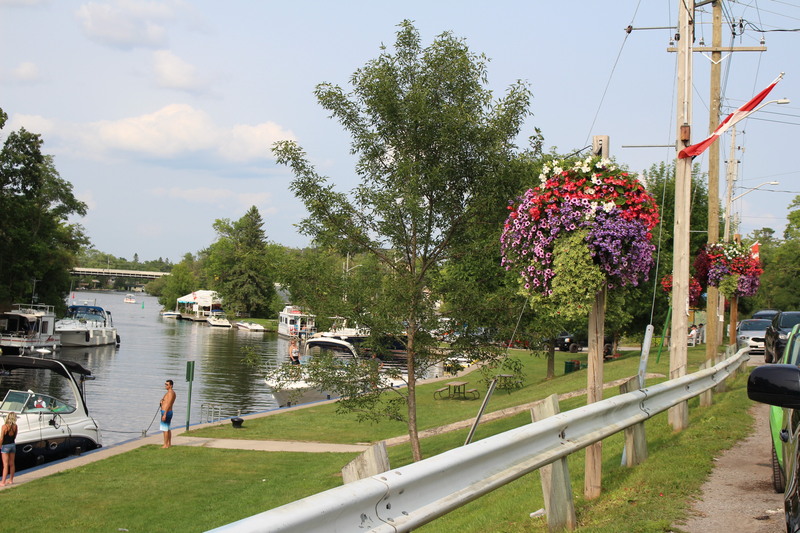 We have been there many times…..these pictures make us want to visit Bobcaygeon again. Enjoy each day.